A while back, Refinery29 put out the recipe for Clinton Street Bakery’s famous pancakes and I almost died. 1) Because I’ve always wanted to try them but the line is all the way to Timbuktu, and 2) because everyone tells me about the life-changing orgasms they get when eating them, and 3) because I’m gluten-free and can’t have them. We didn’t really stray too much from the original recipe, and I’ve noted where we did. The whole process is a bit time consuming, but SOOOO worth it. Just be ready with many bowls, pots, and helper hands. Oh and time. Don’t try to rush through this or you’ll surely fail. Also, a bit of advice…don’t try and make this healthy – be ok with the amounts of fat and whatnot this recipe calls for. 1. First measure and sift all the dry ingredients into a large (preferably stainless steel) mixing bowl: flour, baking powder, sugar, salt. 2. Then in another bowl, whisk together the egg yolks, milk, melted butter, and vanilla until combined. I whisk the wet mixture into the dry mixture. The result should be, and was, slightly lumpy, yet combined to form a batter. 3. Whip (I used a hand held electric mixer) the egg whites in a medium mixing bowl until they reach medium peaks (soft in the middle). Be careful, you don’t want to overwhip the egg whites. 5. Heat a griddle — either an electric griddle, a stovetop griddle, or a big flat pan — to 350 to 375°F. I used a big flat pan, but I can see why people have griddles! Grease the hot griddle with the remaining butter. Drop a cup (approximately 4 tablespoons) of pancake batter on the griddle and cook to set. When you see bubbles start to form on top, lift the pancake halfway up to see if it’s golden brown and crispy on the edges. If ready, flip the pancake. 6. When the pancake is golden brown on both sides, remove with a spatula. 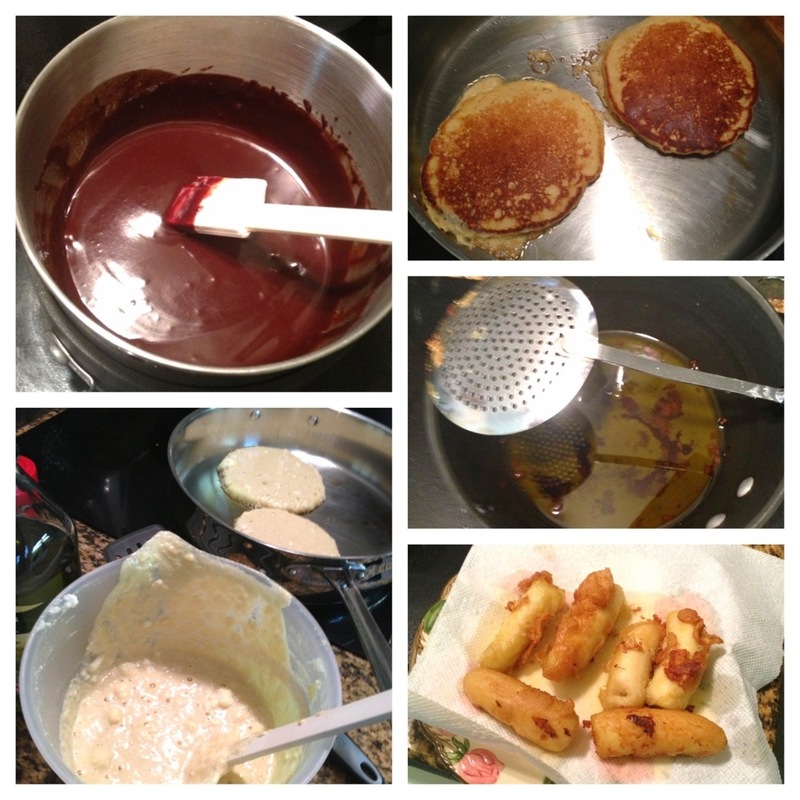 Repeat with the remaining batter and filling, cooking several pancakes at a time (don’t overdo it! If you can only do one at a time, that’s ok!). 1. Melt the chocolate, corn syrup, half-and-half, butter, vanilla, chili powder (I used more than it called for because I like spicy hot chocolate), and cinnamon together in a stainless-steel bowl over a pot filled with warm water on low heat. Mix until smooth. Keep warm until ready to serve. 2. In a separate large bowl, mix together the flour, cornstarch, baking powder, cinnamon, and salt with a whisk. Continue whisking as you slowly pour in the seltzer. Set aside. 3. Fill a Dutch oven halfway with oil. I had to ask my mom what a Dutch oven is—according to my mom, it’s a big pot that you can generally deep fry things in (she’s from the south), but according to Wikipedia, “A Dutch oven is a thick-walled (usually cast iron cooking pot) with a tight-fitting lid”. Heat the oil to 350°F, checking the temperature with a cooking thermometer (I eye-balled it and put a tester in to see if it fried). Roll the banana halves in the batter and place them on a dish. This part is VERY important to do correctly!! With tongs, dip a banana tip into the oil and hold firm until the oil begins to bubble. Gently drop the banana half into the oil but only after you’ve held it in the oil without touching the bottom. Otherwise, your batter will stick to the bottom and fall off. Sad! Fry 2 banana halves at a time for 2 to 3 minutes, or until the bananas turn golden brown and crisp. Use a slotted spoon or skimmer to agitate the bananas every 30 seconds so they do not burn on one side. Repeat with the remaining bananas. 4. Place the fried bananas on a paper-towel-lined plate. Slice the bananas into 1-inch pieces and sprinkle them with cinnamon sugar. 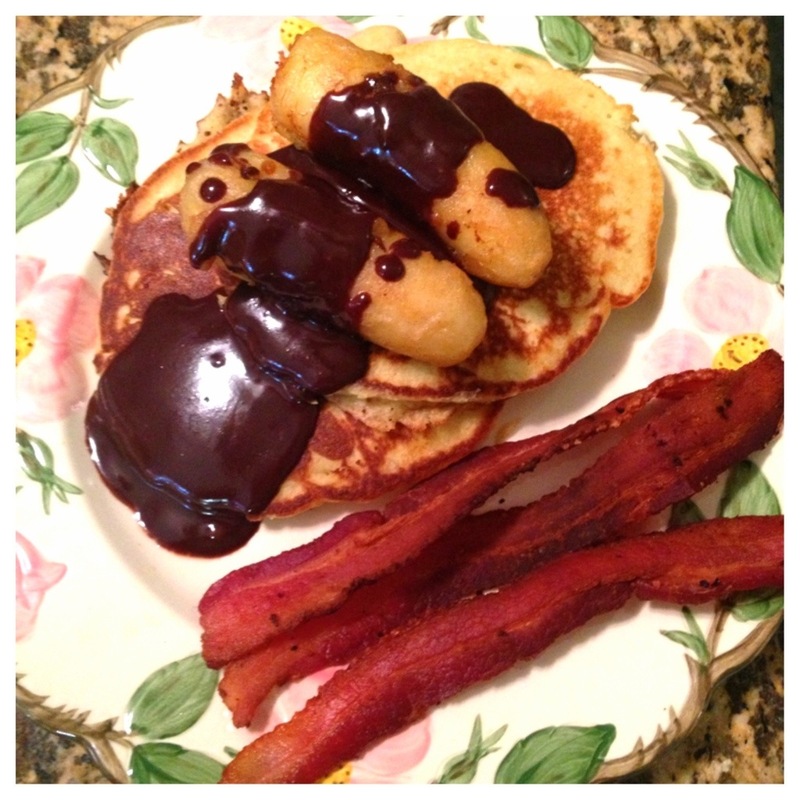 Serve the slices on top of the pancakes with the Cinnamon Chili Chocolate Sauce. And there you go! Clinton Street Bakery’s famous pancakes without the long wait? Yes. Need gluten-free? Yes. These were labor-intensive (not difficult just took some time and counter space) but fabulous. Find Sam on Instagram @thisclimategypsy or on Twitter @samantha_lacey.